When you choose contrasting interior paint colors for your home, you maximize the flow of the rooms. A common trait of homeowners is to choose two interior paint colors that contrast for a room. There are a number of combinations that exist, and homeowners can have an expressive home that is inviting, relaxed, formal, sophisticated, or whatever theme they attempt to create. It is important when your chose your color pallet, that for the best flow of the home, you carry one color, preferably a neutral color, throughout each room in the home. There are many ways to achieve this, such as adding the color to upholstery in one room, the bedspread in the bedroom, a throw rug in the kitchen and so on. When you decorate with contrasting interior paint colors you might paint one wall in a room one color and another the contrasting color or you might paint the walls one color and add trim or crown molding to the wall. There is a variety of combinations and below details how to use contrasting colors in your home. When you begin to choose an interior color scheme your home, you want to take a good look at what’s in your home and determine the permanent items in your home. Take for instance the room walls. A good rule of thumb is to paint the walls a dominant paint color and the permanent fixtures such as fireplace mantels, kitchen cabinets, or shelving units the contrasting color. Select a focal point for each room. This could be an arched or bay window or crown molding. Paint it a darker or lighter color in comparison to the dominant wall color. Take your interior paint colors and choose alternative colors and use them on your trim. For example, use a darker green on the walls and a light green on the trim. If you would like a more formal traditional look you can go for colors such as dark burgundy and gold. Emphasize the features in the room with contrasting wall colors. For short walls you can paint them a light color and for longer walls, paint them a darker color. Smaller rooms should not be painted a dark color, or the room will look smaller. Save the dark interior paint colors for larger rooms and paint the trim on the walls a lighter color to create an intimate feel. In the smaller rooms, use light paint on the walls and on the trim, use the darker contrasting color. Before you begin to paint leave the paint sample in the room for a few days and review the interior paint colors throughout the day as the light changes in the room. Incandescent bulbs can intensify warm colors because of the glow of the bulb and distort the color. Different exposures to the room will also have an impact on the colors and you want to ensure that you are aware of the difference in your color choices throughout the different times of the day. 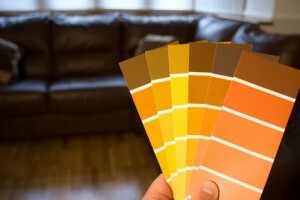 Interior paint colors in a home can mean a huge difference in how you enjoy your home. Atmosphere is created with color and your choice in colors should be something that you can live with for a number of years.